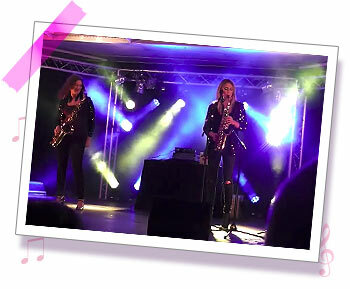 Sister Sax have built up a reputation of the highest quality, and have a combined total of 25 years of experience in every kind of event from amazing corporate events, intimate dinner parties, product launches, festival entertainment, business conferences, formal occasions and exhibitions for guests of up to 1500. Every event, conference or dinner is unique, and making an impression with your guests is paramount, therefore Sister Sax make sure that the entertainment they offer you is of the highest standard, and completely suited to the occasion. So, not only yourself and your guests have the best time, but they also enjoy the evening which encourages only the very best performances. They are classy, upmarket and sophisticated, creating a completely relaxed vibe. So what better way to while away the evening than in Sister Sax style. When it comes to business events, the sheer volume of even a small function band can be a little over powering. With a top class duo/trio like Sister Sax, you can eat, drink and discuss important issues surrounded by the distant sound of intimate dinner music. A suitable accompaniment to any corporate affair and a compliment to your company.